Before applying,please shake the bottle a bit for better consistency. Step 1: Trim and file the nails to the desired length and shape. 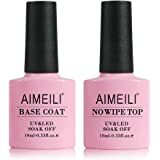 Clean the nails with alcohol pad or nail polish remover. Step 2: Apply Base coat, and cure under UV lamp for 1 minute, LED light for 30 seconds. Cure times vary per lighting system. Step 3: Apply color in a thin application. Cure under UV lamp for 2 minutes, LED light for 30-60 seconds. Step 4: Apply second color coat, then cure under UV lamp for 2 minutes, LED light for 30-60 seconds. Apply third coat if neccessary. Step 5: Apply No Wipe Top coat and cure under UV lamp for 2 mins, LED light for 30-60 seconds. Step 6: Enjoy your 14-Day Manicure! 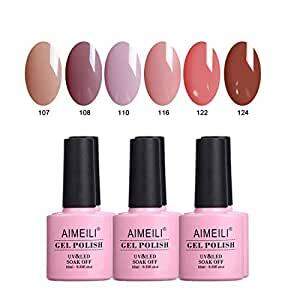 2: Please be sure to apply GEL NAIL POLISH in THIN layer. 3: Please do not apply any gel on the skin/cuticle, or put coats on too thick, or you might feel burning while curing. 4: Please check the curing lamp regularly, avoid using defective lamp.